Love the idea of something beautiful trailing behind you as you walk down the aisle, but want something more unique than the traditional veil or train? 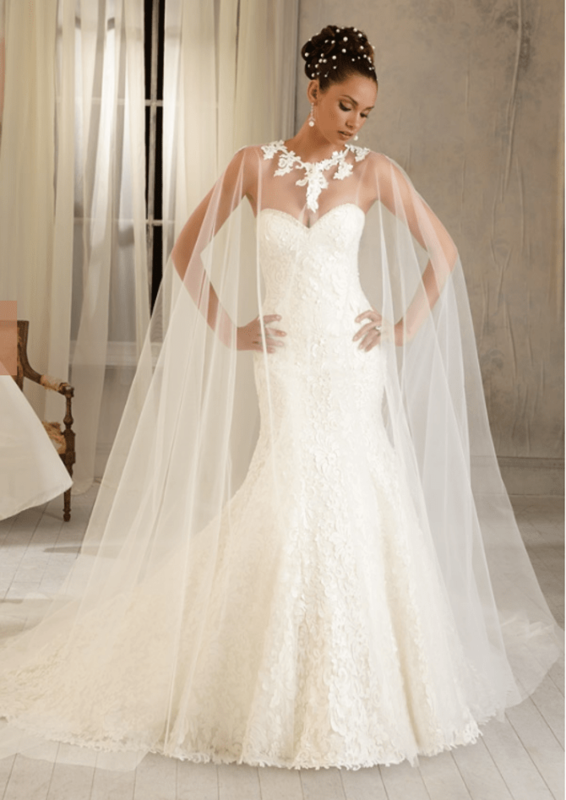 Consider a cape, one of the most popular trends from recent bridal runway seasons. The glory of Autumn is all around. If you have decided that the seasonal beauty will serve as the backdrop for your wedding and reception, you may want to incorporate a jacket, capelet, shawl or wrap into your wedding day look to combat the chillier temperatures and cool breezes of the seasons. Ideal for evening bonfires and dancing under the stars, these accessories instantly add an elegant warmth to any wedding gown. In addition, don’t forget your bridal party. Your maids are going to be by your side all night, exposed to the same conditions. Ensure everyone stays cozy but fashionable by selecting appropriate cover-ups for them as well. You don’t want to have goosebumps visible in your photos, after all. Trying on a variety of cover-up styles is vital to harmonizing your dress with the ideal accessory. When you find the right one you’ll know. It will accentuate the dress and transform your silhouette. Be sure to take a number of test photos with your cover-up on and off since wearing your cape or wrap will completely change your profile. Bridal capes and capelets have traditionally been passed down through the family. You will certainly want to preserve yours so that the option of sharing it some day remains. Pictured above is a short-sleeved bolero jacket from Allure Bridals, style J9. It is the perfect addition to a strapless gown. Notice how it highlights the sweetheart neckline of the dress. New York Bride & Groom in Raleigh has a full staff of knowledgeable bridal consultants available to help you achieve the look you are going for. Stop by our modern luxury salon soon to see how our popular pricing and inspired designs set us apart from other bridal shops. Don’t forget that you never need an appointment to visit our salon and taking photographs is welcomed.